Climate change and peak oil are two key challenges we face this century. While natural cycles of warming and cooling characterize Earth’s history, human activities have heightened recent warming. Our overuse of fossil fuels, such as oil, are a significant source of this problem. Reducing our oil usage in transportation will not only begin to address global warming, but prepare us for a future when oil stocks may be more scarce. WILMAPCO has been considering these issues for some time. The greenhouse effect is a result of greenhouse gases (GHGs), such as carbon dioxide and methane, trapping the sun’s energy in our atmosphere rather than allowing it to escape into space. Levels of GHGs have intensified the greenhouse effect beyond what can be attributed to natural cycles, leading to increases in average global temperatures. View this BBC Guide for some illustrations. Alterations in weather patterns resulting from the greenhouse effect are known as climate change. While tough to predict, serious global consequences can result from this change. Visit the Intergovernmental Panel on Climate Change website for details. 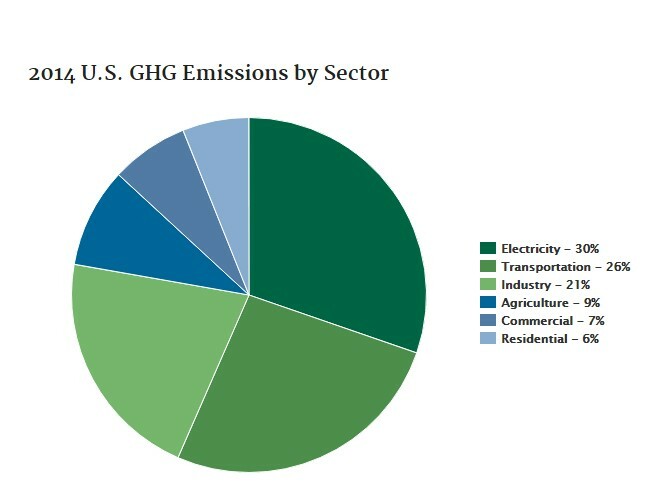 Fossil fuels are a major source of GHGs. 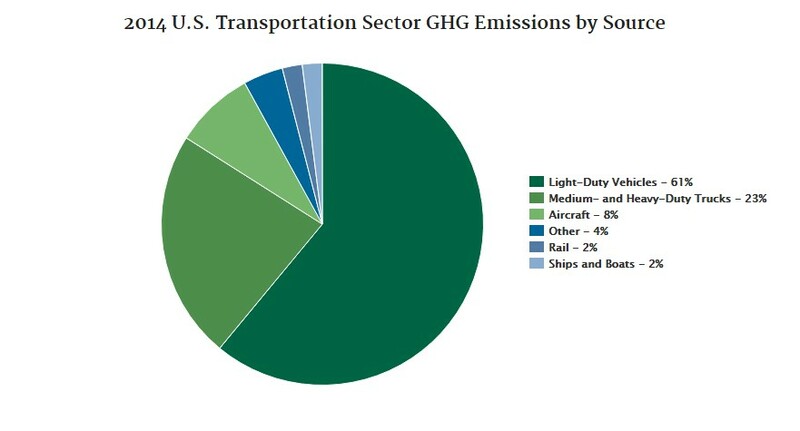 As shown in the graph below, our oil-dependent transportation system accounted for some 26% of GHG emissions in the U.S. in 2014. Beyond contributing to climate change, our oil-thirsty system is under threat from peak oil. A finite resource, many predict oil will soon reach its maximum rate of production (“peak oil”), leading to higher and higher costs. Reducing our oil dependence and improving transportation’s energy efficiency makes for good environmental, political and economic policy. Check out our Climate Change pamphlet (PDF) for more information. We are working with local and federal partners to develop the best ways to check global warming and reduce energy use in our transportation system. We have, for example, joined with the Environmental Protection Agency and other MPOs in the Mid-Atlantic to share ideas about environmental sustainability. In Delaware, we participated in the update of the State’s Energy Plan, developing recommendations to curb energy use through reductions in VMT and the promotion of more energy-efficient vehicles. Follow this link for that plan’s recommendations. Sea-level Rise (SLR) is a consequence of rising global temperatures, one that threatens the transportation systems of coastal regions with increased flooding and complete inundation. To learn more about WILMAPCO’s efforts in this area, please contact Bill Swiatek: bswiatek@wilmapco.org.